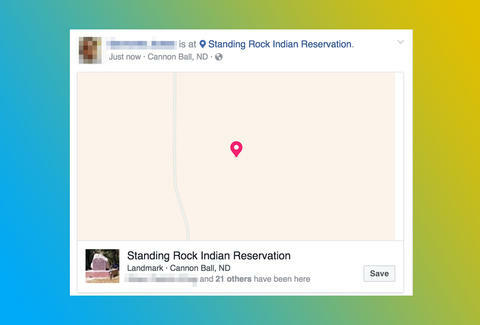 If you were confused by all of the check-ins at the Standing Rock Indian Reservation flooding your Facebook timeline on Monday morning, then you're not alone. At first glance, the flurry of check-ins at the reservation might seem like a weird Facebook glitch or that a bunch of your friends traveled there without inviting you, but it turns out the posts actually have to do with the ongoing protests over the Dakota Access Pipeline. As you may have figured out by now, the friends, co-workers, and family members who checked in at Standing Rock aren't actually there. Instead, the avalanche of check-ins appear to be an orchestrated move to protect Standing Rock protesters from allegedly being targeted and surveilled via Facebook by police. Although it's unclear where the call to check-in originated, the posts suggest that activists opposing the pipeline want several thousand check-ins to confuse and overwhelm law enforcement officials, but there's also a chance that the whole thing is just a giant hoax, according to a report by Vice News. Growing tensions between law enforcement officials and protesters boiled over in recent days, when police in riot gear attempted to force demonstrators from the area -- a standoff that led some protesters to set vehicles on fire and to more than 140 arrests, according to a report by The New York Times. Protesters have camped at Standing Rock for several months to oppose Energy Transfer Partners' plans to finish construction of the Dakota Access Pipeline (DAPL), which would transport oil from North Dakota to Illinois. Native Americans at Standing Rock and other activists opposing the pipeline argue it would contaminate the local water supply in addition to damaging sacred cultural lands on the reservation, per the report. With that said, it's probably more than safe to expect many more Standing Rock check-ins throughout the day. Now you know why. Tony Merevick is Cities News Editor at Thrillist and has never been to Standing Rock in real life. Send news tips to news@thrillist.com and follow him on Twitter @tonymerevick.